Join my email list, and get my ebook Kick Your Sugar Cravings to the Curb. You’ll get tips, tricks and recipes for eliminating sugar cravings without feeling deprived! No cravings without feeling deprived?? Bring it on! How do you feel? I mean, how do you REALLY feel? If you’re like many people, you often feel EXHAUSTED, OVERWHELMED, AND STRESSED TO THE MAX. And you’re not convinced that anything can change… You think that you’re getting older and, well, that’s just life. Maybe you’ve tried EVERY DIET PLAN out there, without success, and feel FRUSTRATED by the million different approaches that seem to contradict each other. Maybe you want to try something new, and have no idea where to even start. Or maybe you know what to do, you just want support, accountability and a cheerleader to help you along. You CAN live in a BODY THAT’S FULL OF ENERGY, with a MIND THAT’S QUICK AND FOCUSED and a SPIRIT THAT’S ENTHUSIASTIC AND VIBRANT! 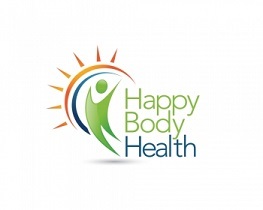 Happy Body Health offers one-on-one and group coaching to help you define your goals and gives you the knowledge, tools and support to reach them. TAKE A LOOK AROUND THE SITE, grab some of the free materials, and if you like what you see, schedule a free 20 minute consultation. It could change your whole life!